One of the reasons I volunteered to index was the glimpses of people’s lives we get from the records. While indexing the records for the Toronto Trust Cemeteries project, I have been following the trends in the Cause of Death column. As I was indexing records for July 1902, one page gave me pause. Of the 52 names on that page, there were nine accidental deaths. This was an unusually high number. Even more unusual was the fact that five of these nine were young men “Killed by Falling Wall” on Thursday, July 10, 1902. I was immediately reminded of my great-grandfather whose death certificate lists the cause of death as “Fell down shaft at Island”. 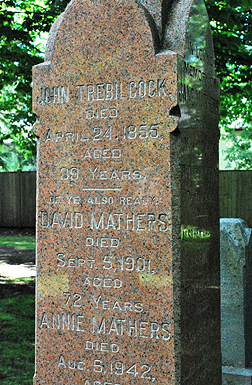 Only six months after arriving in Canada in 1907 with his wife and five children, he and three other men were killed working on the excavation of a tunnel under Toronto Harbour. They fell to their deaths when a cable snapped on the “bucket” that lifted them out of the tunnels at the end of the day. I felt compelled to find out how five young men had been killed by a falling wall. 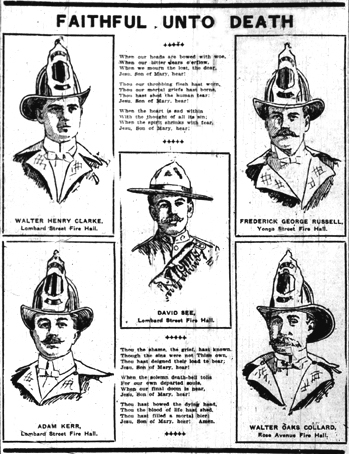 The Toronto Star for July 11, 1902 revealed that they were all firefighters killed by two separate wall collapses while fighting a fire at the P. McIntosh Feed Company on George Street. At one time, the building had been used by the Toronto Street Railway Company for stabling horses and was packed with hay, straw and other highly flammable materials. The blaze was intense and spread rapidly. Within minutes of arriving on the scene at 6:20 a.m., Chief Thompson had called a general alarm to summon other stations. Without any warning, the first wall collapsed on Adam Kerr, David See, and W. Harry Clarke. Despite the incredible heat and danger, men worked to move the rubble to free the men. See and Clarke were found and their lifeless bodies recovered within fifteen minutes. Kerr was located a few hours later only a few feet away. A few minutes after the first wall fell, a second explosion was heard. The south wall had collapsed on Walter Collard and Fred Russell as they were preparing to move away from the dangerous area. A third man who had been with Collard and Russell was saved by the fact that he had gone to turn off the water supply for the hose. It was the largest loss of firefighters in the history of the City of Toronto fire department. 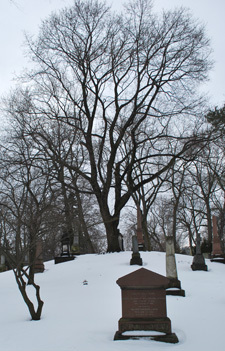 The morning following the fire, permission was granted to the Trustees of the cemetery for the civic funeral, waiving a bylaw that prohibited Sunday burials. Thousands of people waited for hours in the heat outside St. James Cathedral at King and Church and all along Yonge Street. 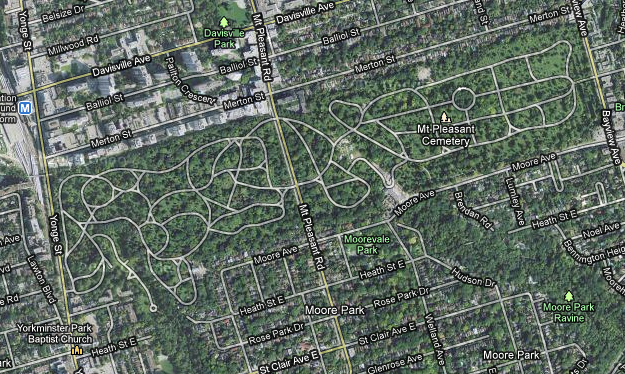 The procession took over an hour to pass any one spot on the route to Mount Pleasant Cemetery. See, Collard and Clarke were buried in Plot B – Section 7 Lot 7, Section 8 Lot 6, and Section 8 Lot 7 respectively. 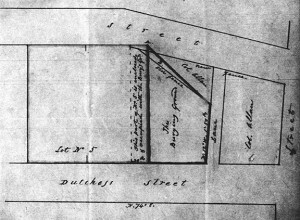 Russell was buried in Plot K – Section 30, Lot 8 and Kerr was buried in Adult Single Grave 1827. These two were subsequently relocated to Plot B next to the other three in Section 6, Lot 7 and Section 16, Lot 6 respectively. 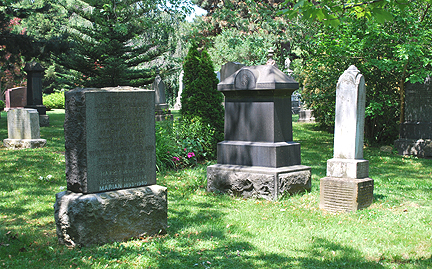 Gravestones for three of the fallen firefighters (L to R: Collard, See, and Clarke) in Section B of Mount Pleasant Cemetery, Toronto, near the Yonge Street gates. In Their Last Alarm, Robert B. Kirkpatrick recounts the stories of Ontario firefighters who lost their lives from 1848 to 2002. He provides us with some of the details of the men’s lives. David See, 32, single, was a veteran of the Boer War in South Africa. Adam Kerr, 27, single, joined the department in 1900. The cemetery records indicate he was born in England. Walter Collard, 32, was the assistant captain at the Rose Avenue Hall. Kirkpatrick identifies him as single but the Globe and Mail reports him married with no children. 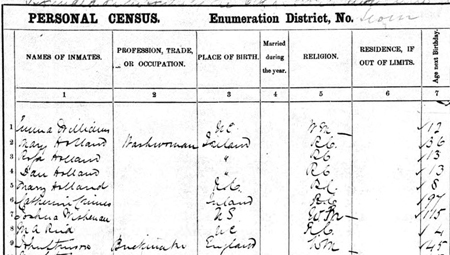 The 1901 Canada census on Ancestry.ca confirms this, showing Walter, a fireman, born in 1870, living with his wife Catherine. Harry Clarke, 27, was married with two children. Fred Russell, 32, was married with three children. According to the Toronto Star, at the time of the fire, his wife was visiting the sanatorium in Gravenhurst, Ontario for treatment of consumption. Returning to that page in the Mount Pleasant Cemetery records with nine accidental deaths, the other four were: Oscar Joyce, 24, who died June 22, 1902 from “injuries falling from a train” in Tyndall Manitoba; Alexander Martin, 69, who died June 27, 1902 in Toronto Emergency Hospital after “injuries to head received in a fall”; Elizabeth Edwards, 17, in a drowning accident at Kew Beach on July 1, 1902; and a second drowning, William Goddard, 22 in the Don River on July 4, 1902. These are stories to be investigated another day. 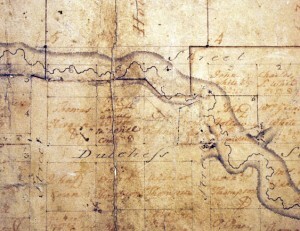 A similar article about David See appears in: Filey, Mike, Mount Pleasant Cemetery An Illustrated Guide, Toronto, Ontario, Dundurn Press 1999, p 192. David See’s gravestone says he died “in his 30th year”. Walter is listed on his gravemarker as Walter Oakes Collard, born June 10, 1870. Harry is listed on his gravemarker as Walter H.
 Further information about the incident, including nearly a full page of biographical data, can be found in the The Sentinel and Orange Protestant Advocate, 12 July 1902, page 5, Archives of Ontario microfilm N 44 reel 11. The author, Tricia Clark, who lives in Aurora, Ontario has been collecting family stories since she was a kid. 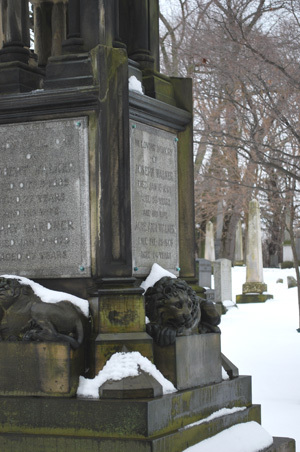 She volunteers as an indexer for the Toronto Trust Cemeteries project as a way to give back to the genealogical community and because it’s fascinating! 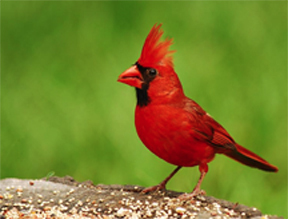 Well, you never know who you’re going to find in the Toronto Trust Cemeteries burial registers! In an attempt to decipher some really careless handwriting in the register of the York General Burying Ground, I consulted the online version of the Globe newspaper. For many of us who live in Ontario, this resource is available free though our public libraries. I could tell that the name in the register was “Peter M. Desh…” but the rest was very questionable. The place of death looked like “Str City”. Mystifying. But the following account of an inquest from the Globe on Tuesday 22 October, 1850 (page 3, column 1) confirmed the surname as Deshong, and allowed me to expand the “Str City” to “Steamer City of Toronto”. On Sunday, an inquest was held before Coroner Duggan, on view of the body of Peter M. Deshong. 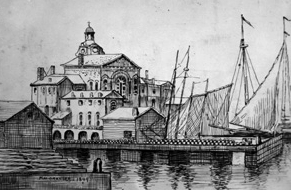 The Jury met on board the steamer City of Toronto, and afterwards adjourned to the City Hall. 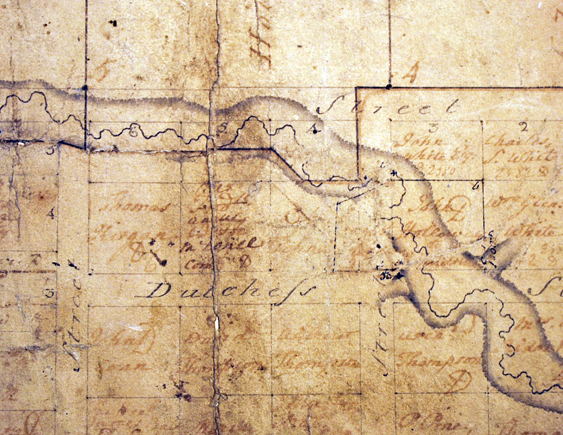 It appeared from evidence, that the Steward of the steamer had gone down to call Deshong, shortly after leaving Kingston, on her upward trip; but he was lying in his berth, and made no answer. Supposing him to be asleep, nothing farther was done until next morning, when he was discovered to be dead. 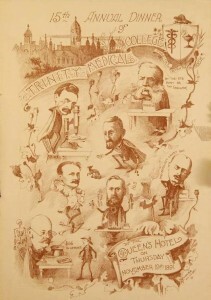 The Jury, amongst whom were Dr. Gavin Russell and Dr. Norman Bethune, returned a verdict of —Died from Apoplexy. On his person were found 5 dollars, and a few shillings. His effects were handed over to Mr. Williams the undertaker, by order of the Coroner, and his body is lying in the vault, waiting instructions from his parents, who have been informed of the sad event by telegraph. It appears from an advertisement in the Indiana Palladium, of August 31, that deceased had invented a new mode of computing figures, by which a person could give a sum total of any column as fast as the answer could be written. The sum total of a column of dollars and cents could be given without adding the figures together, by a peculiar rule of his own, —the same rule, applied to fractions and interest at any per cent. Deceased had been lecturing on Mathematics in Quebec, and was on his way to this City, for a similar purpose, when arrested by the hand of death. He was about 35 years of age. If you’re eager to know more about Mr. Deshong’s calculating method (which he claimed you could learn in a half hour, for the modest fee of $10), type “Peter M Deshong” into your Google search box. If you’re eager to lend a hand with the indexing of the Toronto Trust Cemeteries records, please contact <fsi@torontofamilyhistory.org>. Our gratitude will be “incalculable”. This Dr. Norman Bethune (1822–1892) was the grandfather of Dr. Henry Norman Bethune renowned for his service in China.